The 1989 finished 10th in the state with 4 placers. The Moore Wrestling team started competition in 1971, 4 years after the school officially opened. Coach Nunn was the first head coach at Moore. He only coached for one short year and then Coach Crocetti took over. Coach Crocetti was head coach from 1972 until 1978. In 1978, assistant Danny White took over the head coaching job and coached from 78 until 81. Coach Danny White had two wrestlers place in state. In 1979 heavyweight David Broderick placed 2nd and in 1980, 98 pounder Allen Holbrook took 5th. In 1981 Coach Bill Mosby came over from Thomas Jefferson High School (which had just closed) and brought his team with him which helped Moore tremendously. In the 1982 State Championship Moore entered 6 wrestlers and 112 pounder Marshall Whitfield placed 6th. Mosby coached quite a few good teams at Moore and placed quite a few heavyweights in the state tournament. Two of the best were David Woods and Jeff "Porky" Sims. Woods placed 3rd in 83 and Sims was a two time placer, placing 5th in 85 and 4th in 87. Numbers started to decline in 87 but their was a whole new young group of wrestlers that would step up. 103 pounder Tony Bridgewaters placed 6th in 88. The following year would be the best in Moore history. 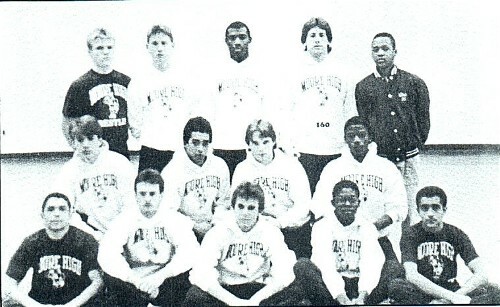 The 1989 team was loaded with lightweight seniors who would carry the team to finishing 10th at the state tournament. Brothers, Scott(103) and Tony(112) Bridgewaters placed 2nd and 5th while two other seniors, 119 pounder John Blanton and 125 pounder Trey Oswald placed 3rd and 6th. The 1989 team is by far the best in Moore history (pictured above). Two years later seniors Eric Walker(171) and James Smith(189) placed 6th and 4th. Moore's enrollment started to shrink drastically in the early 90's and so did the number of wrestlers. Moore had quite a few dissapointing years. Mosby would go onto retire in 2000 and an assistant from Seneca, Gary Cole, would take over. Cole brought some enthusiasm to the program but the wrestlers still were not there. Moore had as little as 5 kids on the wrestling team. In 2002 Coach Gary Cole and assistant Mike Thomas vowed to bring wrestling back at Moore. That year assistant Mike Thomas started the Moore Middle School wrestling team. The Moore Middle team had impact that same year. With a small group of motivated seniors and a full roster for the first time since the early 90's the varsity team finished with a winning record. In 2003, head coach Gary Cole stepped down as head coach and assistant and former Moore wrestler Mike Thomas took over the position. In 2005 the wrestling team relocated headquarters to the old weight room. With years of work and the great help of A.D. Steve Silvano, the wrestling room has become the best in Jefferson County. Moore had success in 2007 placing #5 in the county and then #4 in the county in 2008. The team also won its first ever tournament championship in 2008 by winning the North Oldham Mustang Classic. Senior James Schneider(160) placed 7th that year. Zack Michael placed 6th in his junior and senior years being one of very few multiple state placers from Moore. Zack Michael was also the first wrestler in Moore history to wrestle 7 years from 6-12th grade for Moore. In his honor he received the Michael Award for 7 years of hard work and dedication to the Moore wrestling program. This award will forever be given in his honor to all wrestlers who wrestle from 6th-12th grade at Moore.